Buckle : NIFCO Buckle, ten years warranty. Olive Green. Fits up to 17" laptop in side-opening pouch. Top Loading. Quick access front pockets. Tablet pocket, crush proof sunglass pocket. Upgraded wire handle with padding. TSA-friendly ScanSmart pocket with 15" laptop sleeve. Internal zippered cord pouch. Color: Blue. All functions work great. Original / factory / manufacturer's warranties are no longer valid. In case of international sale. Trending at $43.50eBay determines this price through a machine learned model of the product's sale prices within the last 90 days. Swiss Gear Backpack. Condition is New. Shipped with USPS Priority Mail. TSA-friendly ScanSmart pocket with 15" laptop sleeve. Original / factory / manufacturer's warranties are no longer valid. In case of international sale All functions work great. Get Supersized Images & Free Image Hosting. Swissgear Backpack 18’’ Satin Black Camo New With Tags. Condition is New. Does have advertising permanent pin on the front. See pictures. • Pass-Thru grab handle slides over the handle of wheeled luggage for easy travel. • Padded grab handle. swiss gear backpack . Condition is New. Shipped with USPS Priority Mail. We are here for you on whatever the issue is. We do not refurbish these products. We believe very strongly at Empire Liquidators that good old fashioned up front human talking communication is still the best way to do anything. Used For: Bicycling, Camping, Hiking, International Travel, School, Travel. Swiss Gear 17” Backpack Tablet Laptop Blue. Condition is New. Shipped with USPS Priority Mail. Blue Pattern polyester is both durable and fashionable. Swiss Gear Laptop Computer Adjustable Shoulder Strap Black Bag Soft Case 14"
Great smart scan bag for the traveling with computer. Hold a lot. Swiss Gear Laptop Computer Adjustable Shoulder Strap Black Bag Soft Case 14". Condition is Used. Pens, Knife, Laptop and Key not included. Top carry handle. Adjustable strap. Shoulder strap system. Airflow back system. Air flow back padding. Open access pouch pocket. Music player pocket with headset port. Red and Black. Case Base Stabalizing Platform. Everything else is clean. Part Number - 27316060. Manufacturer - SwissGear. 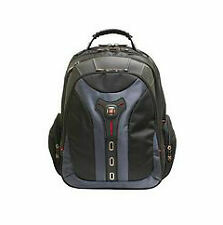 Wenger SwissGear Carbon 17-inch Laptop Backpack is designed for Apple laptops. The backpack is lightweight, comfortable, and offers unparalleled convenience. I didn't attempt to clean it. These are very minor, I just want it to be known that this isn't pristine. Look closely at the photos for actual condition. Color is dark red or maroon with bright orange trim. Bag is in very good condition, with minor wear noticeable. 18.5" x 12" x 6". 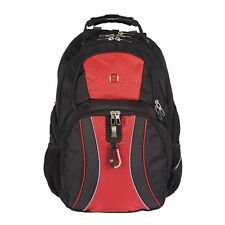 SWISSGEAR 18" LAPTOP BLACK BACKPACK BAG 10-1886 NWT FAST/FREE SHIPPING! WHATS INCLUDED: BAG. WE WILL WORK TO RESOLVE ANY ISSUES YOU HAVE. Trending at $27.34eBay determines this price through a machine learned model of the product's sale prices within the last 90 days. 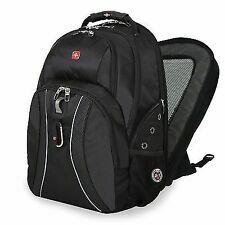 Swiss Gear Travel 15" Laptop Tablet Business Back Pack Book Bag Black New! Looks like a floor display. I can't find a thing wrong with it anywhere. It’s as easy as that. Color:Slate Grey. Made for air travel. -Side zippered accessory pockets. Model No: 1753. Color: Black/Grey Weight: 2.8 lbs. Give us a shot and we will make sure that you will look to us again! Whether you're traveling by plane, by train, or by foot, youll need a convenient way to carry your laptop. The SwissGear laptop backpack is a piece of customized luggage specifically designed to provide that convenience. Its multiple pockets and compartments let you bring practically everything youll need on your travels. What size laptop will fit inside this backpack? When youre looking for a backpack to carry your computer, youll need to know what size screen you have. If your backpack is too small, it won't accommodate your laptop. Conversely, if the laptop backpack is too big, it may not provide adequate protection. Accordingly, available designs are calibrated to the screen size of computers. What are some of the this brands attractive features? SwissGear luggage is designed with durability, comfort, and convenience in mind. Shoulder pads: Padded shoulder straps increase carrying ease. Panels: Mesh panels facilitate ventilation, which will allow you to wear your backpack for extended periods of time. Compartments: Zippered compartments for storage mean that your chargers and other important pieces of equipment can be packed securely. Handles: These laptop backpacks are equipped with strong handles so that you can carry your backpack like an ordinary piece of luggage whenever you wish. Stitching: The stitching along pocket seams and zippers is reinforced to enhance durability. What are some of the available backpack materials? When you select a SwissGear laptop backpack, youll be able to choose among many different materials and colors. Different materials have different properties of durability and weatherproofing, so its important to think about the conditions under which youll be using the pack before you buy. Choose the model that meets your functional and aesthetic needs. What is a TSA-approved backpack? In most airports, TSA will require you to take your laptop out of its bag so that it can be scanned. This can be a time-consuming process. SwissGears Scansmart backpack can be opened so that it lays flat, which means it can be scanned while your device is still in it. This allows you to get through the TSA security check with far less hassle. What are some of the available SwissGear color options? Content provided for informational purposes only. eBay is not affiliated with or endorsed by SwissGear.